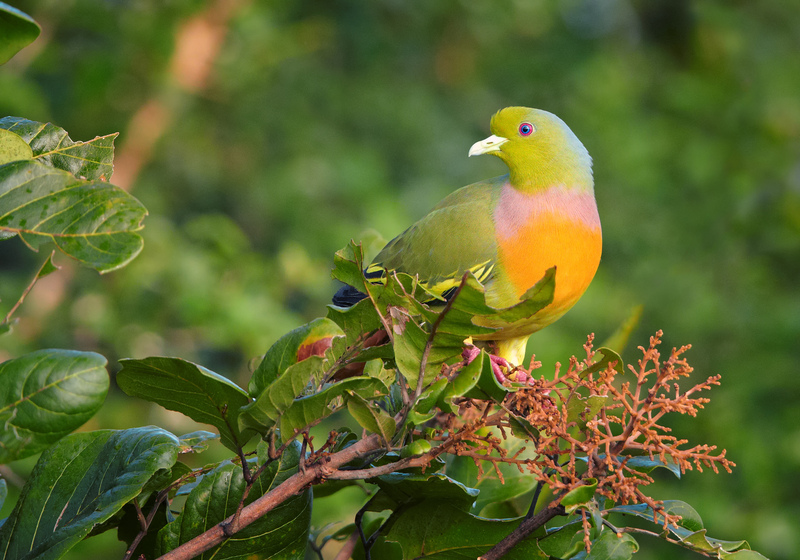 Meet the Pink-necked Green Pigeon (Treron vernas). While this multi-coloured bird has been called the Rainbow Pigeon, with others saying it looks like a Pokémon or a Neopet, it is actually a really common species in Southeast Asia. Due to its sheer abundance, the Pink-necked Green Pigeon is considered to be a Least Concern (LC) species by the International Union for Conservation of Nature (IUCN). Besides Indonesia, where it is known as Punai gading, this bird is also native to southern Myanmar, Thailand, Cambodia, Vietnam, Malaysia and Singapore. 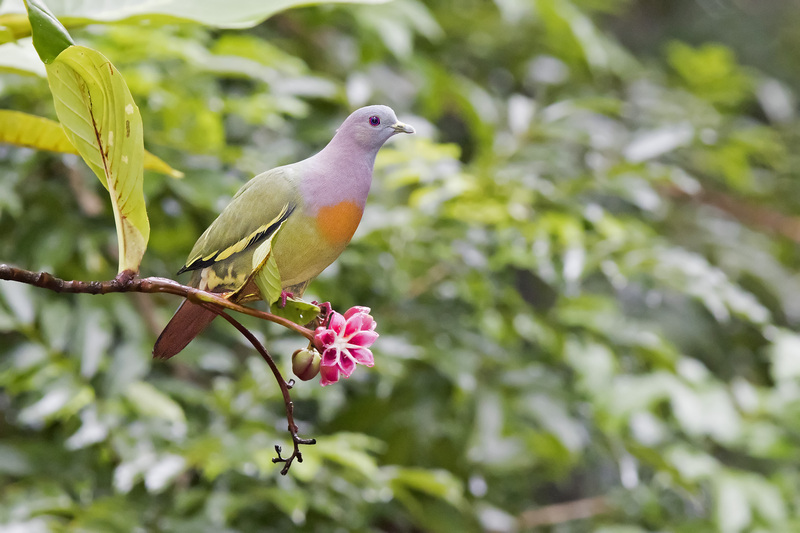 In Singapore specifically, the Pink-necked Green Pigeon is considered to be the most common species of green pigeon. 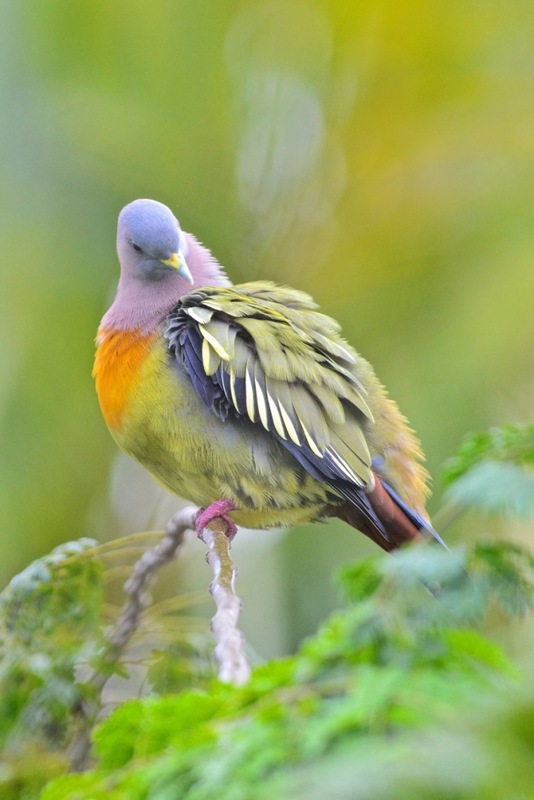 The Pink-necked Green Pigeon is also one of the 304 species of birds which have been identified in the Restorasi Ekosistem Riau (RER) area, where it is observed to be a resident species. In RER, it’s one out of the 10 bird species belonging to the Columbidae (dove and pigeon) family. It’s considered to be a medium-sized bird, measuring 25 to 30cm (the length of a common long ruler), weighing around 100 to 160g. The Pink-necked Green Pigeon has a grey head, pinkish neck, orange breast, olive green back, green wings, yellowish belly and pink or reddish legs. It also has a white, pale blue or grey bill, and a grey tail that ends in a black tip. However, these colours are only found in the male bird. Female birds are mostly green, lacking the striking pinkish and orange plumage the male boasts. 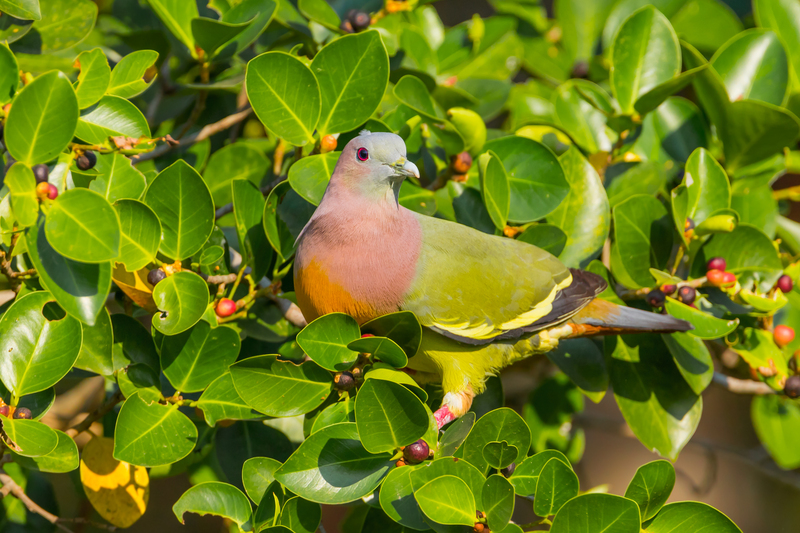 While the Pink-necked Green Pigeon lives in forests and coastal mangroves, it is also readily found in human environments including gardens, plantations and farmland. It is an arboreal (tree-living) species, rarely coming to the ground except for a drink. The Pink-necked Green Pigeon is a known frugivore, consuming a wide range of fruits, particularly figs. The species is also an important disperser of fruit seeds, using its muscular gizzard – which contains grit – to grind and digest the seeds inside the fruit. Oddly enough, not every individual Pink-necked Green Pigeon has been observed to have this grit. This bird is a social species, typically feeding in small groups and roosting communally. Its nest is usually a fragile arrangement of sticks, with both male and female birds splitting the incubating duties over 17 days. Chicks are brown, and tend to leave the nest 10 days after hatching. However, they may remain in the nesting area for a few more days while their parents continue to feed them. Although the Pink-necked Green Pigeon is currently in no danger of extinction, the RER team has recorded observations of the species being hunted and trapped for food. The Pink-necked Green Pigeon is one of the 299 species of birds included in a bird checklist which was published by the RER in 2017.